What were the biggest social media trends in 2017? Despite being around for decades, AI is currently one of the most popular topics in business with Gartner predicting that by 2020 AI will be a top five investment priority for more than 20% of CIOs. AI is currently closing the gap between detecting patterns from large data sets and predicting intent (a role traditionally reserved for human marketers and merchandizers). AI-powered technologies are replacing the manual work traditionally completed by merchandizers to make product recommendations and marketers to make ad spend decisions. For now, AI will not completely replace all human effort, but it will dramatically improve the effectiveness of ecommerce teams that use it while enhancing the experience of shoppers who purchase from AI-centered ecommerce businesses. The primary way AI has taken the online world by storm is by delivering highly personalized experiences shoppers desire. Using AI to personalize the customer journey is a huge value-add, and those that have implemented personalization strategies see sales gains of 6-10%, a rate two to three times faster than other retailers, according to a report by Boston Consulting Group. Many ecommerce websites use AI-powered product recommendations engines to target and personalize which products are displayed to customers. A variety of machine learning algorithms have been developed by technology vendors (including Episerver) that alter the recommendations based on the stage or channel a customer is shopping in. For example, algorithms that prioritize top selling products may be used on a product details page while algorithms that prioritize complimentary products may be used on the cart and checkout pages. 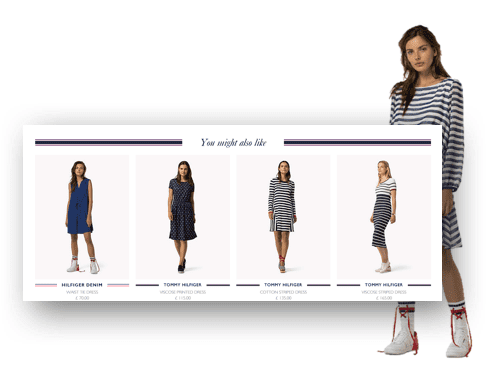 AI-powered personalization tools are now extending into new stages in the customer journey such as personalizing search results on ecommerce websites to each individual shopper and injecting personalized product recommendations into new digital touchpoints such as shoppable mirrors. Personalized site search tools like Episerver’s Personalized Find automatically change the sort-order of product searches based on the behavior of the user who is conducting the search, which has the potential to dramatically improve relevancy of search results and lead to higher conversion. But the most transformative AI-powered tools we will experience as consumers will use natural language processing (NLP) to understand and respond to voice and live chat interactions. NLP chatbots can be embedded and used through major messaging applications to act as customer service agents without needing a human. Chatbots make it easy and fast for customers to reach retail businesses using the same messaging services they use daily. NLP voice commerce tools and virtual personal assistants (VPAs) will also transform how consumers interact with ecommerce websites, by allowing them to search and purchase using voice commands in scenarios where a customer doesn’t have a touchscreen or computer. In fact, by 2020, Garter Research predicts end-user spending on VPA speakers will reach $2.1 billion, growing at a compound annual growth rate of 43% from 2015 through 2020, while by 2018, 30% of our interactions with technology will be through “conversations”.